Change can be both a good thing and a bad thing. Some people find change refreshing and welcome it from both hands, while others seemingly like their life as it is, no matter how hard they are just not wired to adapt a change. So what if something huge happens in your life, you get enrolled in a school you didn’t intend to go to, or get a job somewhere far away or have a recent relationship upset or just have a schedule bombarded with work 24/7. In such instances, change in your life has to be accepted and if applied successfully, you will not only adapt well, but also lead a peaceful life. 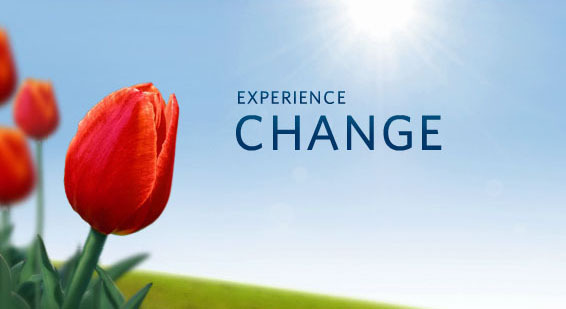 Here we provide you 5 best tips on how to accept change and move forward. The first thing to do when you have so many changes going on in your life and you cannot get a minute to catch breath, is to step back. Many a times when you are bombarded with tasks and responsibilities and you barely get time to spend for yourself, you often get this fleeting thought of, “what if I could just slow down for a moment?”. That is the time, when your body and your mind is actually telling you to slow down because it getting hard for them to play catch up. Once you take a pause, you can have a clearer view of your life, clean up the mess, reorganize yourself and give your mind the space it needs. Another great way to stay sane in this rush hour of your life is to stay fit. Eat well, keep yourself hydrated, go for a walk, gives those lungs oxygen and your body and your mind will thank you. A fit mind brings a healthy body which in turn gives a healthy perspective. Quite literally this is what you need to do. You can either do it on a board or a piece of paper or just in your mind. But make it. Set your life’s goals up. Some times when change is overwhelming we get so caught up with all this work that we almost forget to appreciate and work for our goals and lose focus. In order for you to succeed, and stay focused, write down what your goals are and why in particular you want to achieve them? Once you have done that stick that board or piece of paper somewhere you can easily see, your mirror, your cupboard, your refrigerator, somewhere that you see it every day, it will be like your little reminder of why are you doing all this why are you hustling and will help you keep on going. For instance, you want this promotion or this degree really bad. But you will not earn it in a day or two. There is no shortcut to success you have to work very hard for it. Make your plan and stick to it. Slowly and gradually, reach all the milestones and you will be able to get what you have hustled for. If you are getting overly pressurized by your work, do not let it get the best of you. Don’t be afraid to call for help. if your timetable is so stock full of work that you don’t get time to sleep, eat or do anything personal then this work should be stopped at the most immediate. Take up those opportunities which are easily adjustable with your skills and time and learn to say “No”.